Six creative students of Centre Point School, Katol Road won accolades internationally for producing the film titled ‘The Attraction’ The film was produced under Chinh Media Camp held last year and has been reviewed and selected by a renowned, experienced and impressive international Jury. The film has been awarded Fourth Place in the Peacemaker Corps 2017, 9-13 age category for the Peace In The Streets Global Film Festival. The Awards will be presented on 9th Nov’17 in New York City. It will also include a tour on 10th November of the UN and the United Nation Alliance of civilization, a video festival and film workshops. The winners from Centre Point School, Katol Road voiced their views about what peace in the Streets means to them through this creatively produced film. They have also become part of the Peace Maker Champions family and have an open invitation to participate for the 2017 festival by creating another video. These talented film makers include Khush Batra of Class X, Anoushka Rajwade of Class VIII, Ridhima Meghe of class VI, Saanvi Jaju of class VI, Arnav Khemka of class VI & Harman Singh Randhak of class IV. 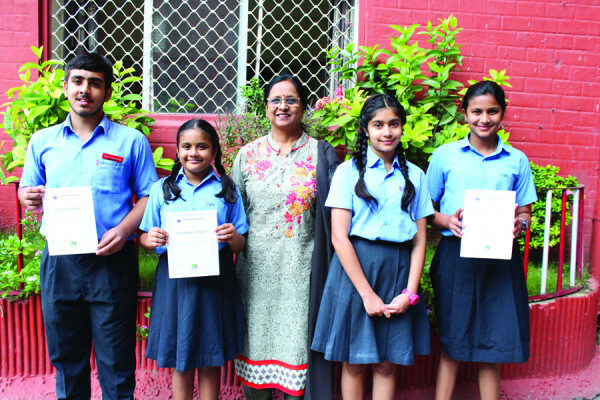 The promising filmmakers were commended by Mrs. Shilpee Ganguly, Principal, CPS KR, Vice Principals, staff, and students. They won a thunderous applause in the school assembly.